Part of President Abraham Lincoln’s enduring legacy is the reputation he earned as a gifted orator. He is the president who delivered two of the greatest speeches in American history: the Gettysburg Address, and his second inaugural address. These are speeches that are familiar to many Americans, and both are inscribed on the Lincoln Memorial in Washington, D.C.
Photo: Abraham Lincoln, 28 February 1857. Credit: Alexander Hesler; Library of Congress, Prints and Photographs Division. At the time he delivered those emphatic words, Lincoln had only experienced a brief fling on the national stage. He had been elected to the U.S. House of Representatives in 1846, but only served one two-year term – as he had promised when running for the seat. Afterward, he returned to his law career in Springfield, Illinois. What drew Lincoln back into the sphere of politics, and forever changed the course of American history, was passage of the Kansas-Nebraska Act in 1854 – which he adamantly opposed. This bill ineffectually tried to stave off civil war, and quell the growing unrest between pro- and anti-slavery factions, by allowing the residents of Kansas and Nebraska to decide for themselves whether to allow slavery in their territories prior to applying for statehood. 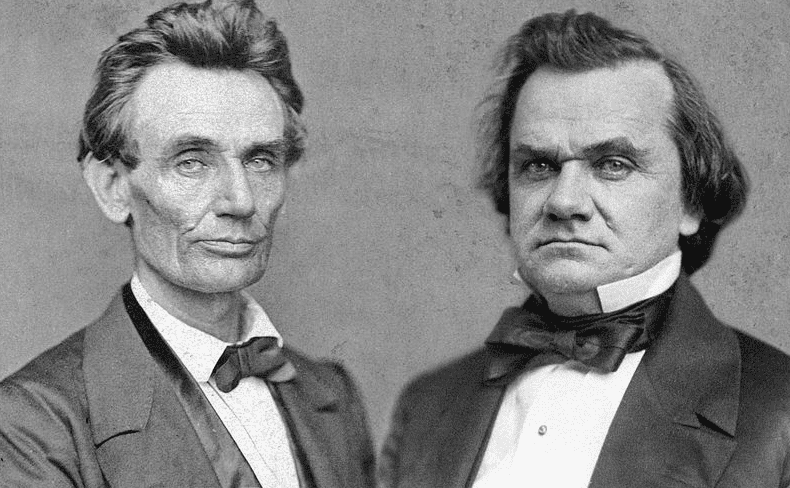 Photo: composite image of portrait photographs of Abraham Lincoln (1860) and Stephen Douglas (1859). Credit: Marsh & Vannerson; Wikimedia Commons. 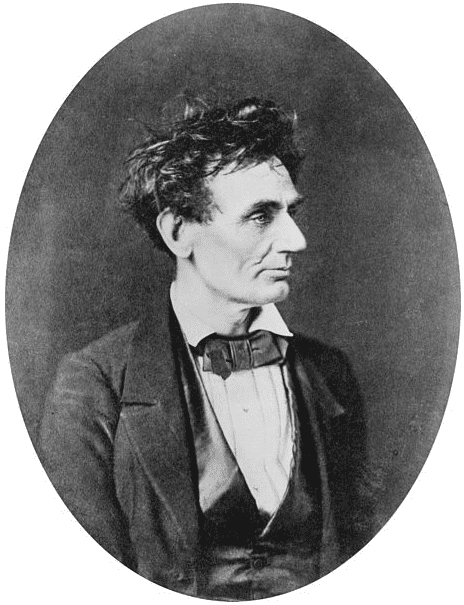 Determined to return to Congress and stem the rising “Slave Power” seemingly gaining momentum in the national government, Lincoln campaigned to be the Whig Party’s candidate to represent Illinois in the Senate in 1854. He lost, but gained attention for his anti-slavery stance. Two years later, in 1856, Lincoln came in second in the contest to be the Republican Party’s candidate for vice president. His political career on the ascent, Lincoln kept plugging away, and in 1858 the Illinois Republican Party nominated him for the U.S. Senate. That event prompted his “house divided” speech, gaining Lincoln further national attention. Although he lost the race to his rival, Senator Douglas, the seven famous debates the two engaged in during the 1858 senatorial campaign cemented Lincoln’s reputation as a gifted speaker and a committed opponent of slavery – paving the way for him to become the Republican Party’s presidential candidate on 18 May 1860. On 6 November 1860, Abraham Lincoln was elected the nation’s sixteenth president, beating – among other opponents – the Democrat’s candidate, the very same Stephen A. Douglas. We print elsewhere the compact and forcible speech of the Hon. 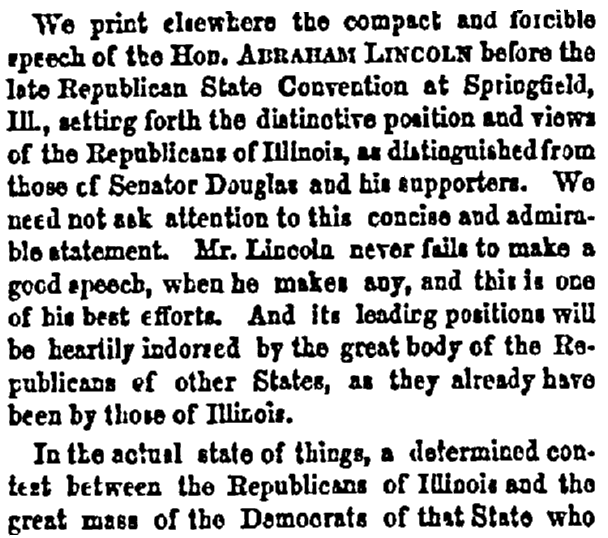 Abraham Lincoln before the late Republican State Convention at Springfield, Ill., setting forth the distinctive position and views of the Republicans of Illinois, as distinguished from those of Senator Douglas and his supporters. We need not ask attention to this concise and admirable statement. Mr. Lincoln never fails to make a good speech, when he makes any, and this is one of his best efforts. And its leading positions will be heartily endorsed by the great body of the Republicans of other States, as they already have been by those of Illinois. In the actual state of things, a determined contest between the Republicans of Illinois and the great mass of the Democrats of that State who sympathize with Mr. Douglas, is inevitable. We have earnestly hoped that this contest might be avoided. So long as the Slave Power remains in possession of the Federal Government, and dispenses for its own aggrandizement the Sixty or Eighty Millions which annually flow from the Treasury, it has seemed to us desirable, in the light of principle no less than in that of policy, to soften and efface whatever differences may at any time exist between those who, from whatever cause, are arrayed in practical opposition to the aspirations and the rule of the Cotton Oligarchy. We have looked to and labored for a union in 1860 of all who were found arrayed in opposition to the late flagitious attempt to impose a Slave Constitution on Kansas by the power of the Federal Government and in notorious opposition to the clearly-expressed will of the People thus sought to be subjugated. 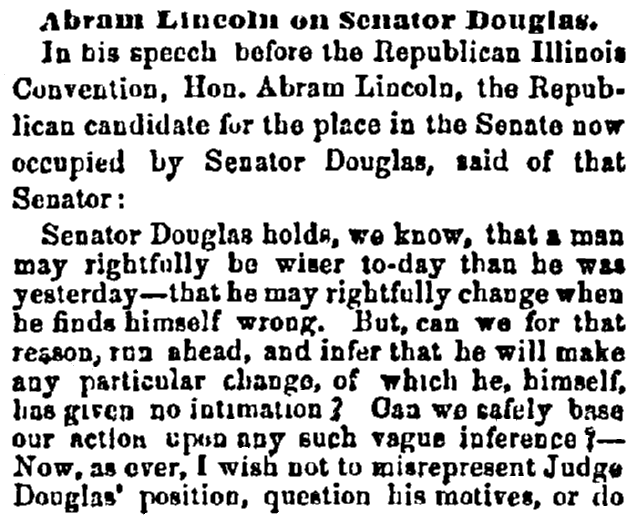 As a step toward this consummation, we have desired and labored for a substantial accord in their approaching Election between the Republicans of Illinois and that immense majority of the Democrats who stand with Douglas on the platform of Popular Sovereignty. Our expectations have been disappointed. Our efforts are, for the present, baffled. Illinois is to be the arena this year of a desperate contest which we would have gladly aided to avert. We lay no blame on this side nor on that. We do not say that this contest was not inevitable. We only fear that its effect will be, as its tendency certainly is, to drive back One Hundred Thousand Illinois Democrats into a position of open alliance with and virtual subserviency to the Slave Power. Should such be the result, it will be our unfailing consolation that we have done what we could to prevent it.